On many occasions we’ve been asked to change the color and feel of an event space. With the use of pipe and drape and event lighting, a dull and lifeless space with distracting features such as wallpaper, artwork, and signage will disappear. Consider creating a clean backdrop to accentuate your theme, or partition your cocktail hour space in the ballroom. Whether you’re softening, dividing, covering, or accentuating a space, Eventions Event Designs can transform your event with event draping and event lighting that is customized to meet your style and budget. We offer many different colors, textures, and weights in event draping which makes it an incredibly affordable and versatile product. Our drapes range from sheer to heavy velour and are inherently flame retardant and flame retardant. Drapes range from 8’ to 22’ in height and are rented by the lineal foot. Also, we provide the newest trend in event draping with textured panels and spandex walls which is featured on our website. Event lighting is the single most powerful element to the best photos, the right mood, and a great party. 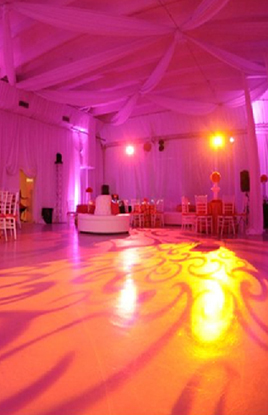 Our event professionals can meet with you to discuss uplighting, pin spots, textured lighting, and monogram projection. YES, our eco-friendly, power-efficient LED lighting fixtures are battery-powered, thereby reducing power requirements from thousands of watts down to hundreds. Eventions Event Designs is green. We operate with no wires, no plugs, and no limitations! We aim to push boundaries and committed to deliver exciting tailored installations of event draping and event lighting for corporate events, trade shows, weddings, parties, proms, performances, or any other celebration. Our services are budget-friendly and competitively priced. From floor to ceiling…….wall to wall - We got you covered! Please take a moment and browse through our color selection for event draping options.